For women (and men), going out camping in the woods or fishing can pose a challenge. When nature calls, as it inevitably will, you must strip down to answer it. 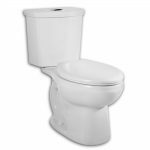 This causes many women to worry about their privacy and there is always the concern of urinating at an odd angle and soaking your foot. Not to mention the simple fact, squatting is not the most comfortable position to be in and there are certain times that you really do not want to have to squat somewhere. That is where the Camco toilet can help you the most. You will never again need to squat. 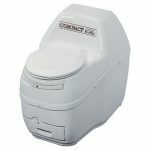 This portable toilet has a 5.3-gallon (other sizes available) holding tank to ensure that you do not have to empty it every day, similar size to the Theford 550e. This tank is also detachable to make cleanup easier. 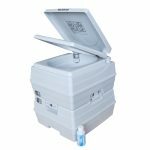 Even though it is detachable, you do not have to worry about it leaking when you go over rough waters in a boat. This is because there are slide valves that lock securely and side locks to secure the toilet to the tank. These features also work to keep odors in. Needless to say, its a great portable boat toile﻿﻿t. 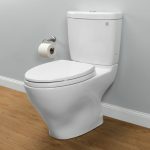 This is a bellow type flushing toilet. 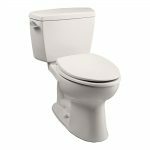 It includes a 2.5-gallon fresh water tank for flushing. It is large enough to be comfortable, but no too large to be easy to move. It measures 16.38” H x 13.75” W. Depth is 16.3”. 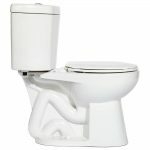 The seat width of it is 13 inches with the inner area measuring 8.5” W x 9” D.
This toilet is very lightweight when empty. However, it can become quite heavy when filled to full capacity with waste. It can weigh as much as 330 pounds. You can also use orange drop-in samples or some other type of odor shielding product. If you are curious about the waste tank and how easy it is to clean, you should know that it is easy to empty. There is a cap that is located on the back of the waste tank. It easily opens and you then dump out the waste. What Do Owners Think of the Camco? This toilet does not hold water in the bowl. 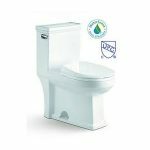 Therefore, most owners recommend that you push the handle to get a little water into the bowl before you put solid waste into the bowl. This will ensure that it is not a sticky mess when you are finished. 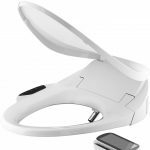 The toilet water it uses can be measured in ounces, so putting a little in the bowl, is not going to waste much fresh water. 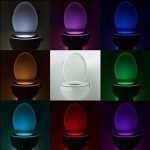 All in all, most people feel that this toilet is worth having. 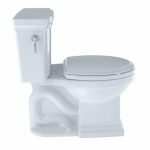 Most portable toilet reviews say it is very usable and easy to deal with, especially for the low price that you have to pay to purchase it. They say that it does not leak and that there is not a lot of odor when you walk near it. This is why it has an average rating of 4.4 stars after nearly 400 reviews. Is Camco a Reliable Option? Only 3% of the people who purchased it, give it a 1-star rating. This alone should tell you something. 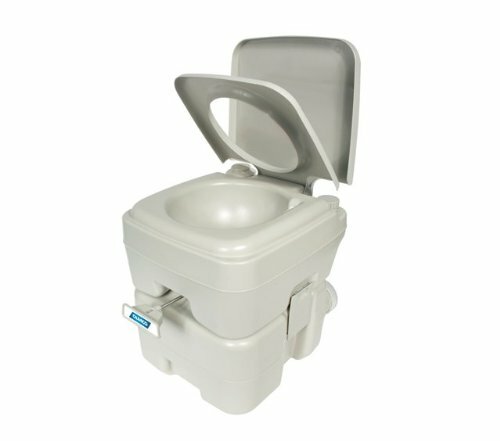 It is a portable toilet that costs you less than $70, nearly half of the Visa Potty. The saying, “You get what you pay for” may apply to it, but it is a risk that is worth taking. It eliminates the need for a woman to squat to take care of her business and it is easy to deal with when it comes to cleaning. 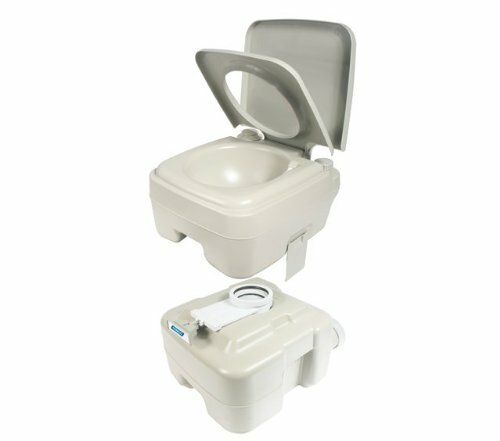 Do you really think you could ask for more than from a toilet that you can take along with you when you head out into the great outdoors?